04.01.2006 - I was driving along, singing a song, when suddenly I had to stop driving. For I noticed a scent, and I was hell bent on doing some dead animal diving. By dead animal diving, I don't mean leaping headlong into a carcass - I mean investigating and photographing the scene of the crime. I got out of the car and found this wild pig carcass. I suppose, thinking about it now, that this isn't all that interesting. However, it's the only evidence I have as of now of a wild hog. Sure, I've seen the destruction they cause. They can absolutely decimate a lawn when they root through it for food. It's really something - the lawn looks like a rototiller hit it. Anyway, this wasn't an official dead animal removal job. I left the animal where it was, on the side of the road. Still, I was glad to have found a dead pig. Not so glad about my newfound tendency to stop and investigate unknown roadkill smells while driving. I wouldn't have ever done that back when I was a financial analyst or software engineer. What has my life come to? Do it yourself: Visit my How To Get Rid of Feral Pigs page for tips and advice. A Few Interesting Facts About The Feral Pig - The Feral Pig goes by a number of other names such as the wild boar, the wild pig or the wild hog. This animal is an ancestor of the domestic pig, and it is easy for them to hybridize which just goes to show that they are practically the same genus. These animals are native to Central Europe and Northern Europe, as well as the Mediterranean region. They can also be found in large parts of Asia, and some have even been spotted as far as Indonesia. Some of the animals have been introduced to other parts of the world such as America and Australia. They main reason for doing so is for hunting purposes. The Feral Pig has a characteristic look that makes it very easy to identify. It has a very compact body which features a large head and short legs. It is usually covered in fur or varying colors, mostly brown, black or dark grey. The fur usually comprises a number of stiff bristles mixed with finer fur underneath. The adults normally measure around 1 to 2 meters long excluding the tail, which is usually around 15 to 40 centimeters long. They also have a shoulder height of around 60 to 100 cm. the typical weight of the average Feral Pig is something that depends on the geographical region of the boar. For instance, those found in Italy usually weigh around eighty to one hundred kilograms, but there are some in Tuscany that weigh up to a hundred and fifty kilograms. However, some of the largest Feral Pigs are found in Russia and Romania, where it is common to find boars weighing around 300 Kilograms. One of the other characteristic features of the Feral Pig is their tusks. These are usually a feature on the male of the species. They represent continuously growing canines. These are usually used as tools and weapons as well. These tusks are normally around 2 inches long, but some can be much longer than this. The females have very sharp canines as well, but these do not protrude as much as the male�s do. When not in the breeding season, it is common to find that the male feral pigs are solitary animals. However, the female ones usually stay together with their offspring and other females in groups which are known as sounders. Each of these groups usually has around 20 pigs. These animals are normally nocturnal, taking the day to relax and using the evenings and mornings to scavenge for food. They are omnivorous, and are very well known to eat almost anything they come across. 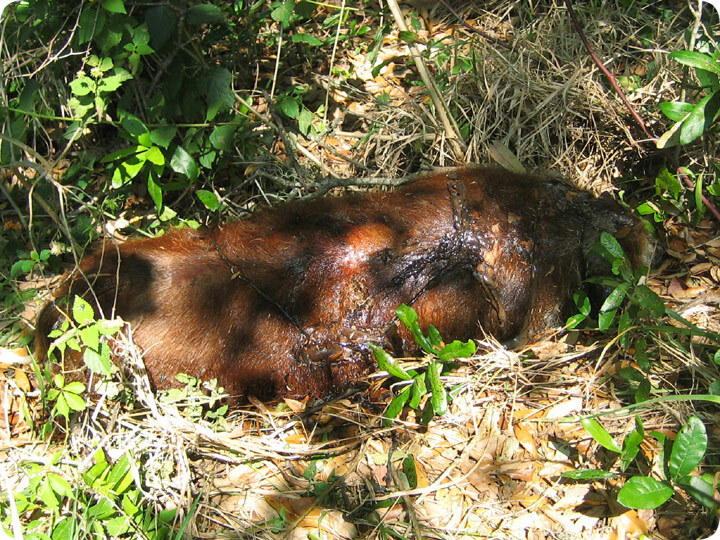 In Australia, the Feral Pig is even known to be a predator for young lambs and deer. One thing that one has to know is that such animals can be very aggressive, especially when guarding their young. They are known to defend themselves with a lot of vigor, with the males using their tusks to slash while the females bite. Though they are mostly found in the wild, these kinds of pigs are also reared for purposes of meat production these days.